Sometimes i think the workshop is pretty damn special, and sometimes i think, what's the point? no one literally needs a "workshop." we can all teach ourselves by just doing the work. The thing is that every time i'm able to get over myself, hush that annoying inner voice of self doubt, so that i can throw myself into teaching, something special actually does seem to happen -- i truly feel like i help---i know i i try my hardest, i genuinely care, and the people who come really do appear to benefit. I know this, because they tell me. Although, to be fair, i'm sure the ones who don't politely keep their mouths shut. The point is, i'm having another go at it in 2015. I don't know if i'll keep teaching them forever or not. some cities fill up crazy fast and i cry tears of joy--- and some cities don't always fill and i cry tears of...not joy. please read all those words on the promo pic to get an idea of what's covered, as well as go through the faq's. and if you want to save $50, sign up before jan 3o, by clicking one of the links below. the workshop is one day only from 9-6 and includes a one hour shooting period in the afternoon. usually the day is wrapped with a non mandatory, informal dinner which spouses are welcome, dare i say encouraged to attend. i will proceed to ask over personal questions about how you met, fell in love, and what your love languages are. a laptop, or digital device to take notes with, or just a good old fashioned notebook---i meeeaaannn, i'm not fancy. a workbook with the workshop information will be provided. its full of prety pictures, made by my friends at artifact uprising and good for taking notes in. bring any camera gear you plan on shooting with during the day, and all of the questions you can think of. i find it helps to write them down ahead of time because they tend to escape the mind in the moment. silly things. is this just for family photographers/professionals? the majority of attendees are professionals (of all levels) and have an interest in shooting families. 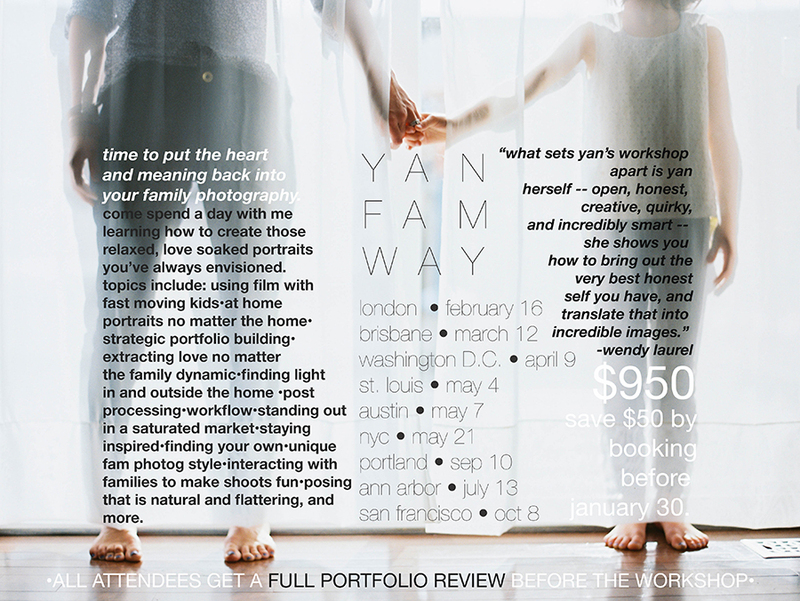 i would say the emphasis of the workshop is two fold: 1.how to best work with families and 2. how to identify your own unique photographic voice. you do not have to be a professional or family photographer to benefit from the latter. i have had a number of attendees who qualified as neither. does it matter if i shoot film or digital? in short, no. i don't believe in medium discrimination! but we will spend some time discussing film, so don't hesitate with all your film questions. but seriously yan, what makes this workshop different? i'm gonna have to say the time and attention i spend on getting to know YOU and making sure you walk away from the workshop with what you came for. and that's on top of teaching you everything i've ever learned about family photography in one too short day. every participant gets a question sheet before they come to help me achieve this. i also clock a lot of hours pouring over each attendees portfolio to give them targeted feedback, also pre game day. i even give an assignment to be completed BEFORE the workshop tailored to specific areas of needed growth for each participant. are you getting the picture? this isn't about coming to hang for a day so you can learn how to do exactly what i do exactly how i do it, though i don't hold any of that back. rather, there is a huge emphasis on you and your own personal strengths and journey. because i care and because i want to see YOU succeed. is this just a feeling fest? okay okay, you caught me, there's some of that because i'm not gonna lie---i have found that life success, artistic success, even monetary success in best case scenarios is tied to honoring one's core self, and letting that drive one's endeavors. figuring out what or who the crap that is can take some work and be a little emotionally uncomfortable. but please believe me when i say that i'm not in the business of selling feelings. this workshop is an intense mix of inspiration, time tested strategy, and tangible tools that have the ability to transform your entire approach to photography and the way you run your business. my goal is to send each attendee away with at the very least, a personalized plan that makes sense for THEM. ohhhh, the most uncomfortable question ever. i would offer refunds if i could, but its a logistical mess on my end! so, all seats once claimed are non refundable. i know, i know, life happens, things come up, we get poor, i get it. that's why i have no problem with you finding someone to "sell," your seat to, or if you are unable to attend, using your payment as a credit toward a future workshop. you must be paid in full at least six weeks prior to the date of the workshop you are attending. CLICK HERE to guarantee your spot in one of the workshops.